> Today I started using iGTD, a Mac OS X application for todo-management. This application helps you to get yourself organized, registering all things you need to do in a single database on your own machine. Overall iGTD v1.4.5.6 seems to be a well-designed application that is very usable for it’s core functionality. It works very stable on Mac OS X 10.4 (Tiger). I have not tried running it on 10.5 (Leopard). Search everything – when searching, you currently have to choose from “Search by task name or note” and few other options, but “Search everything” is not an option. I’d like a single operation to search project names, task names, tags, etc. Dates – Although iGTD displays dates in a friendly format such as “Today” or “Tuesday”, it’s not possible to enter dates that way. It would be nice to just type “tue” and get iGTD to recognize that as “this coming Tuesday”. Resize window – When increasing the size of the main iGTD application window, the last column in the task list becomes wider. By default, that’s the “Due date” column, which doesn’t need that much space, normally. Instead, the “Name” column should be widened, which contains both the task name (left-aligned) and the tag names (right-aligned). Effort colors – The effort column in the task list allows 4 values, ranging from low to high (see the image). The values are represented by a bar that is shorter (for low effort) or longer. Each bar length has it’s own color, these are (from low effort to high): dark grey, green, brown and red. It would be nice if the colors would be more intuitive, such as: green, orange, red and black. Defaults – It would be nice if the configuration would allow that tasks entered without details (e.g. via “Quick type”, hotkey F8) are explicitly be assigned some defaults, such as a default project. 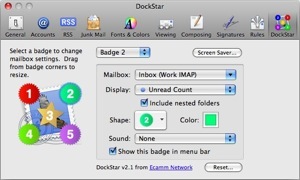 Dock icon – iGTD offers the option of putting the number of open tasks in your Inbox in the dock icon. That’s very nice indeed. It would, however, by even nicer if it could show the combined number of open tasks from all contexts, or even show multiple numbers, for different contexts, similar to what DockStar (see image) does for the Apple Mail application. Resize panes – The main application window is divided in 3 main panes: the list of contexts or projects, the list of tasks and task details. It would be nice if these panes could be resized, for example to allow more room for the task list. Multi-client – I am one of the (probably many) people that do work in multiple locations, from different computers, but want to have the same personal information in all these places. To accomplish this, you can use a combination of .Mac (for your address book, certificates, etc. ), del.ico.us (for your bookmarks). What I could not find out yet, is whether iGTD also supports working from different computers in an easy-to-setup manner. In my opinion, iGTD is a great application that is very usable. And the iGTD 2 alpha looks very promising!